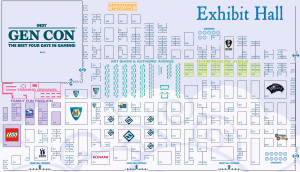 Last night GenCon released the Exhibitor List & Map so future attendees can see where their favorite game companies will be positioned in the new expansion. That’s right, this year’s exhibit hall will not be in the same place as last year, but rather in the shiny new areas along Capitol Street. GenCon even made a video to walk you through the new area.